Kansas landscape artist, Bob Sudlow, passed away at the age of 90 last month. He was a sweet and gentle man. Twenty five years ago I was one of Bob Sudlow’s not-so-young students. It was his last year of teaching and I had returned to the university for a painting degree. I found that I loved painting outside. This oil sketch was done on my first outing with Bob. The setting was in the woods above his home. 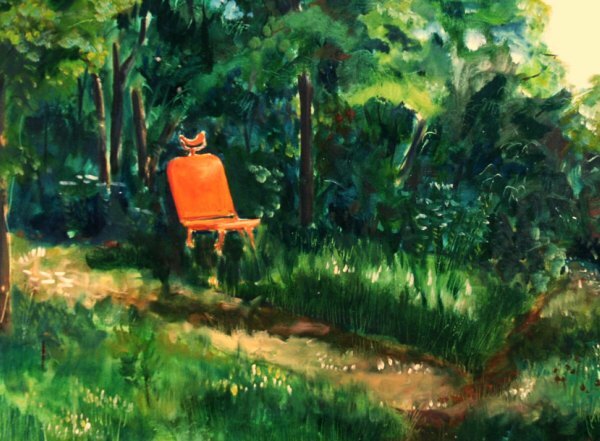 The bright orange antique dental chair was one of several that could be found scattered along walking trails through the woods of Bob and Barbara Sudlow’s country property. It speaks perfectly to Bob’s practical, yet whimsical spirit. 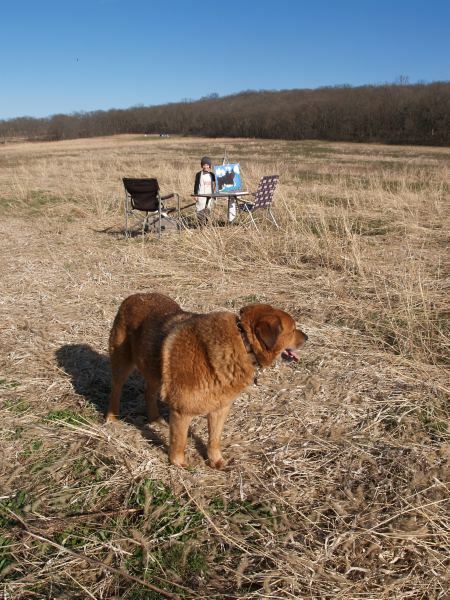 Bob once told me that if I wanted to find out if I’d like to be a painter, the Flint Hills offered a solution. Rent an inexpensive loft in one of the small towns in the Flint Hills, paint for a year, then examine your work and how you feel about the experience. With a family that wasn’t practical at the time. However, I give Bob complete credit for introducing me to the beauty of the Flint Hills. The prairie is the landscape surrounding a host of intriguing characters whose lives I find fascinating and whom I count as friends. Through the years I have found more satisfaction in incorporating the landscape as an element in my painting, combining still life and portrait with it. I continue to plein air paint and sometimes take my grandchildren. When painting the weekend after Bob died, I could imagine that shock of thick white hair blowing in the wind as he stood before his tethered easel, beautifully capturing that elusive time of winter’s exit and spring’s arrival. He loved chasing spring. I am so very glad to have known him. I know that chair! It’s probably still out there rotting away..havent looked for it in years. Lovely written piece!